The internet has leveled the playing field in the hospitality industry. It’s no longer big guys vs. big guys and little guys vs. little guys—instead, everyone is competing against each other for the attention and loyalty of travelers. 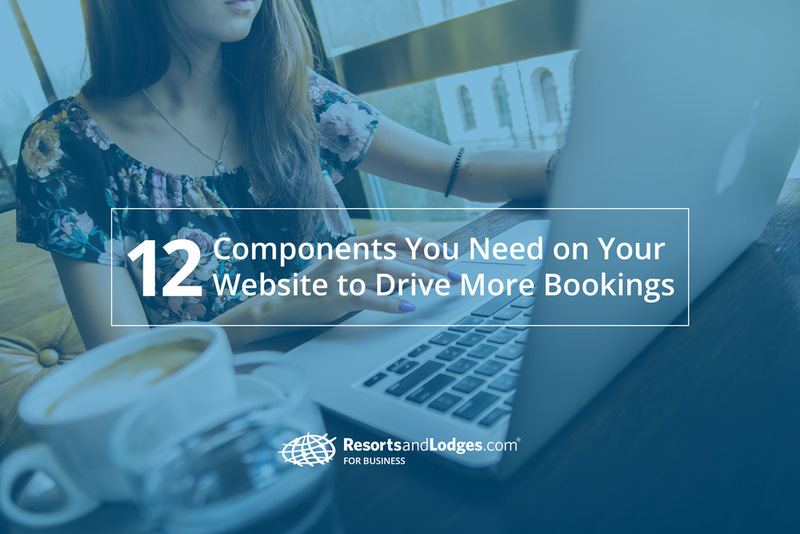 To differentiate from competitors, capture more leads, and drive more bookings at your property this year, you need a website that compels visitors to act. Images can make or break a potential booking for someone who lands on your website for the very first time. In most cases, potential guests won’t have the opportunity to physically see or tour your property before deciding whether or not they want to make a reservation. With this in mind, it’s extremely important that you’re able to quickly present visitors with the information they need in order to stay on your website and continue exploring. High quality photos placed strategically throughout your website can help you make the right first impression, and will keep your visitors from leaving to go view the website of another competing property in your area. Hero Photos: one or more resorts photos that you can feature in the first section of your website (above-the-fold along with your reservation fields and ‘Book Now’ call-to-actions). Outdoor Property Photos: Rich, vibrant photos that help website visitors imagine what it would be like to walk outside around your property. Accommodation Photos: Help illustrate the various accommodations that you offer at your property. Activity Photos: Help illustrate the types of activities guests usually participate in while they are staying at your resort (ex. kayaking, hiking, golfing). Restaurant/Food Photos: Feature your on-site restaurant, or the food that you prepare for guests while they stay with you. Indoor Property Photos: Help visitors imagine themselves walking through your doors and exploring your property from the inside. Room Photos: Give visitors an inside look at what the rooms you offer actually look like. People Photos: Photos that show happy people staying at your property, participating in activities, eating at your restaurants, and interacting with your staff. When building or updating your property website, you should incorporate photos that ultimately allow you to differentiate from other properties in your area, help visitors overcome any objections they may have about booking a reservation with you, and make it easy for them to imagine what it would be like to stay at your property. To drive more online bookings, you also need to include clear and compelling ‘Book Now’ call-to-action (CTA) buttons on your homepage and throughout your website. You should include a clear CTA button and messaging somewhere above-the-fold on your website. In other words, a new visitor should be able to land on any page on your website for the very first time and be able to start the reservation process within a matter of seconds. Use color to make buttons stand out more. Consider using a contrasting or vibrant color when building your Book Now or Check Availability buttons. Test different language in your CTA messaging and button text. For example, you might use language like, Book Now, Check Availability, or Plan Your Trip. Keep at least one CTA button in the same place on every page on your website. Make it easy for visitors to find and access your buttons. The easiest way to do this is by incorporating them into your header (into the main menu or a separate sub-menu). Don’t worry too much about including a wide variety of CTA widgets, messaging, or buttons on your website. The people who land on your site are there to make reservations. Your job is to make it as easy and enticing as possible for them. Links to area attractions – Help visitors understand what they can do and see while staying with you. Bulleted list of your best amenities – Give visitors a quick summary of the amenities that make your property unique or especially desirable to guests who stay with you. Links to photo galleries and video tours – Help visitors see what your property looks like from the inside and outside. List of a few great reviews from happy guests – Showcase great reviews and testimonials from other guests that help persuade visitors to book now. Use quick links and lists to sell website visitors on not just your property, but also the experiences they’ll get to enjoy when they stay with you. Social proof can also be an incredibly powerful and effective tool for driving website conversions. The basic idea behind social proof is this: people who are interested in staying at your property want to know that they’ll be making the right decision when they book a reservation with you. But they don’t just want to be convinced by you, the resort manager—they want to hear from other people who have booked with you before and find out what their experiences were like when they stayed with you. Idea #1: Guest Reviews – Include a review section on your website that visitors can scroll through when they want to see what people think about your property. You can either include an actual live review system on your website, or you can manually pull your top reviews and feature them individually in various places throughout your website. Idea #2: Guest Photos – Create photo galleries from recent guests. When your guests check in with you, offer some sort of freebie or discount if they agree to take and share a few photos from their stay with you. Idea #3: Guest Videos – Ask guests to take videos during their stay and share them with you after they return home. Feature the videos in a gallery or video player in various locations on your website. Idea #4: Packaged Stories – Create mini case studies with the help of your best or most frequent guests. Hire professionals to schedule some time to capture a few photos and videos of your guests while they stay with you. Offer a discount on their next stay in exchange for helping you create a packaged story for your website. The goal here is to present your website visitors with objective opinions and feedback from other guests about your property in an effort to help them overcome objections and drive them to convert. To differentiate from local competitors, create enticing and unique packages for guests. Think about your resort amenities and the surrounding area and create of a few packages that inspire a getaway. To create the right packages, think about who your ideal guest is and what they would be most interested in. For example, if you manage a bed and breakfast in a small town, consider putting together a romance package that includes accommodations, a romantic meal at a local restaurant, and a private wine tasting. If you manage a resort with spa services, consider creating a ladies getaway with accommodations, spa bookings, and brunch. Again, the point here to is trying to sell visitors on experiences, not just your property. Intentional packages like the ones you see in the example above can be an easy way to convince website visitors to book with you instead of the property down the road. Adding storytelling components to your website is another great way to differentiate from competitors and help persuade visitors to book a stay at your property. As mentioned earlier, the internet has essentially leveled the playing field for the hospitality industry. Competition is more fierce than ever, and it’s up to you to show people why they need to come stay as your guest. Storytelling is one of the most effective ways to connect with people. Why? Because the world feeds on stories. People don’t just want to stay in a room with a shower and a sink. They want to create memories, share experiences, and support worthwhile businesses. In text paragraphs on your About page – help people understand the rich history or interesting story behind your property, your location, and yourself. Give them a reason to want to support you. In a video embedded on your homepage – Hire a professional videography crew to document real stories about the people who work at your resort. Make people feel compelled to meet your staff face-to-face. In photos featured throughout your website – Remind people that there are actual real human beings keeping your property alive. The goal here is to use storytelling to humanize your website, make the right first impression, and connect with visitors on a deeper level. This one may be a given, but I feel it’s still important to mention: make sure your phone number is easily accessible on your website. Despite how far the internet and technology have come over the past decade, many people still prefer to pick up the phone and talk to a real human being when deciding whether or not to book a reservation. Make sure your phone number is easy to find on every page on your website. The best place to put it is in the header or footer navigation menu. Worried you won’t be able to keep up with the calls? Use TRACK to streamline your phone interactions with potential guests. Including this information on your property website will prevent your visitors from needing to leave in order to search for their answers elsewhere. Your goal is to get them to stay on your website and only leave after they’ve booked their reservation. Any potential guest who is considering staying with you will need to feel absolutely confident that they understand what to expect when they open the door to their room for the first time. Give them the information they need. 75 Resources for Writing Incredible Copy that Converts from Kissmetrics – this resource will provide you with a mix of blog posts, guides, and case studies that you can use to become a better conversion-driven copywriter. 189 Powerful Words That Convert: Write Copy That Gets Your Customer’s Attention Every Time from Buffer – this resource will help you understand how to use language and specific words to drive website visitors to act. The resources above don’t specifically relate to copywriting for property websites, but they will help you understand how to use key techniques and principles needed in order to drive more people to click your ‘Book Now’ CTAs. I’ve mentioned it a few times in this post, but it’s worth mentioning again—if you want to drive more bookings this year, you have to invest in video. Thanks to social media sites like Snapchat, Instagram, YouTube, Facebook, video has become an incredibly effective way to build awareness for your business, differentiate from competitors, and connect with your target audience. Again, because most people won’t be able to physically tour your property before they make a reservation, it’s important that you make the right first impression. Video can help you do it. Finally, you should include social media links on your property website. If you’re regularly engaging with guests on social media sites like Facebook, Instagram, and Twitter, make sure your website visitors know about it! It’s an easy way to build a relationship with them, and it can help you leverage social proof in order to drive more bookings, as mentioned earlier in this post. Which website component do you think makes the biggest impact when it comes to driving more bookings at your property? Add your thoughts below.